This online module is part 1 of our blended Emergency Paediatric course and is only 3 hours of unit 1 (day 1) of the full 6-hour Emergency Paediatric First Aid course. 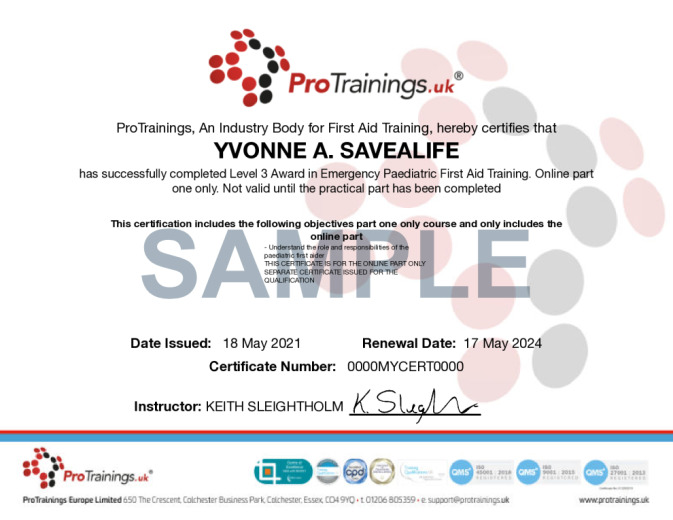 This online module will constitute of around 3 hours of online training, which means you will need to complete a 3-hour practical session to meet 6 hours of training to meet the full unit 1, titled: Emergency Paediatric First Aid Level 3 (VTQ). This is the latest 2019 version of the EPFA course. In many situations, if you are registering with Ofsted you will need to complete 12 hours of training, this means completing our full two days classroom course or by completing the blended option which consists of 6 hours of online training followed by 6 hours in the classroom. This course comes with 3.0 hrs (6.0 class) of CPD, although the time to complete the course online may be less than this. Total course time includes 3 hours and 17 minutes of video training as well as knowledge reviews, final test, remedial help and reviewing downloaded material.